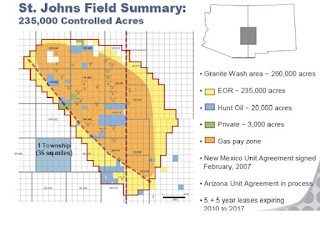 There's a short news item in the Oil & Gas Journal, a weekly trade magazine, describing the exploration program of Bisbee-based Arizona Oil & Gas Corp. Exploration editor Alan Petzet reports that the company's affiliates have 150,000 acres under lease in Cochise County and is exploring for Devonian reef structures. 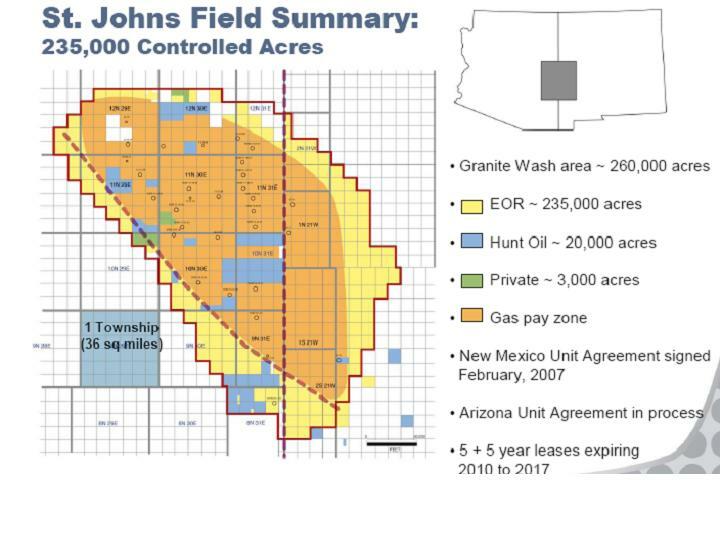 The company reportedly plans to drill in late 2012 or early 2013. It's somewhat unusual for an event this small to be felt but local geologic conditions can be a big factor in transmitting seismic waves. At least one spammer has discovered this blog. Over the last 5 years, there has been a low level of spam comments received that I delete before being posted. But now, some troll for an online payday lender is bombarding me with hundreds of purported comments that are just links to their sales pitch. Fortunately, the blogspot spam filter has caught all of them (I think), so I just have to delete the stacks of notifications in my inbox. To help ensure the site is not hijacked by these jerks, I added a word verification step before any comments can be submitted. I'm sorry for the extra step, but apparently readers of this blog are an attractive audience. The past few weeks have been busy for us on our two DOE geothermal data projects. 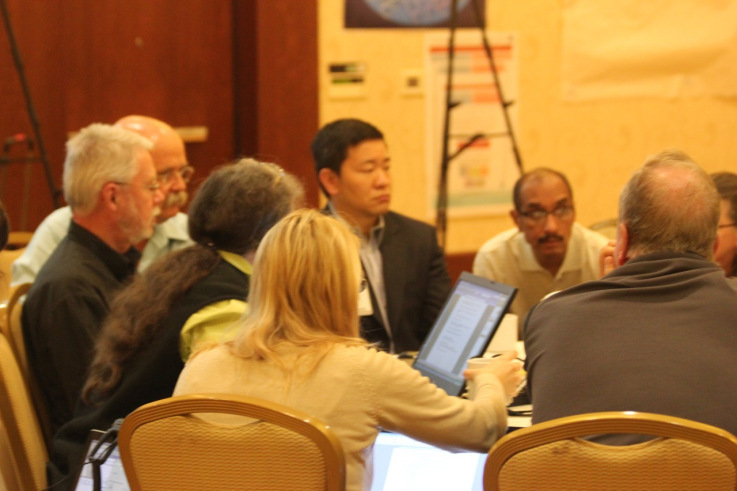 We just got back the results from the annual Peer Review held in Denver for all the DOE-funded geothermal projects. AZGS runs the largest project in the country, and one of the most complex, with 44 subcontractors across the country, integrating data and web services from all 50 states, on behalf of the Association of American State Geologists (AASG). Overall, the State Geothermal Data project that we run got glowing reviews from the external review panel - most categories were given "Outstanding" ratings. The rest of the rankings were the second tier of "Good." There were no significant criticisms. Mostly, there are questions about how we will transition the data network from development to operational status in the next year and what we can do to assist another project that is supposed to build a user interface (ie, web portal and desktop applications) for the National Geothermal Data System (NGDS). Second, we are a subcontractor to Boise State Univ. on the original NGDS design-test project to build the data integration framework that will be used to link five independent projects into a system. We spent two days in Boise last week with university administrators, other project partners, industry consultants, and DOE program managers, to hammer out a revised plan to fast-track that project from its original 5-year timeline, to complete it in the next 15 months. "EarthCube is a collaborative endeavor between NSF and the community of geoscientists and cyberscientists" as a prototype for implementing it across all the sciences and IT fields as a component of the NSF's Cyberinfrastructure for the 21st Century (CIF21) and the White House "Big Data" and Digital Government initiatives. "The goal of EarthCube is to transform the conduct of research by supporting the development of community-guided cyberinfrastructure to integrate data and information for knowledge management across the Geosciences" according to Tim Killeen and Alan Blateky at NSF. AZGS is the prime contractor on an NSF grant as the head of the Governance Roadmap Work Group to develop a governance plan for management and organization of EarthCube. AZGS was selected by an ad hoc coalition representing 60+ national organizations to serve in this role. 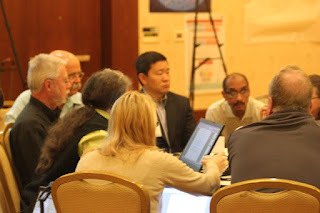 We had 3 months from the launch by NSF to write the funding proposal, get it approved, hold a series of virtual community workshops, and use that input to prepare a comprehensive roadmap to deliver at a national workshop outside Washington DC on June 12. We were successful. There were about 10 roadmaps being developed in parallel, the rest are all technically oriented. Our 218-page report is posted online at http://earthcube.ning.com/group/governance/forum/topics/june-1-2012-governance-roadmap-draft. We envision an evolutionary process that accommodates any of seven different governance models to carry out any single function of EarthCube depending on what is most appropriate, and a system of systems model for interaction among the components. We based this by examining governance of all other national and global IT and infrastructure development such as the electric grid, the internet, transportation networks, etc. The next step is to implement the roadmap in cooperation with NSF and support of the geoscience community so that an operational governance structure is in place by year end. We have a target of Aug 15 to give NSF specific recommendations on how to set up the management and organizational structure and get it in place quickly, since so many of the other components of cyberinfrastructure are dependent on the governance. The holes need to be permitted because the drill through geologic zones that could contain, oil, gas, helium, or carbon dioxide. 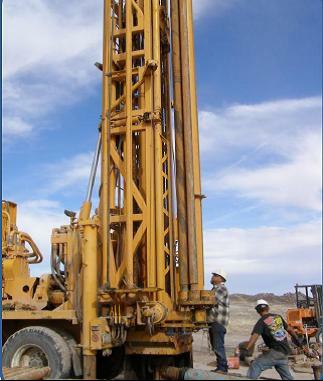 More than 100 core holes have been drilled by companies in the area in the current exploration programs. One of the most significant conclusions is "Hydraulic fracturing to date has been confirmed as the cause for small, felt seismic events at one location in the world. The process of hydraulic fracturing a well as presently implemented for shale gas recovery does not pose a high risk for inducing felt seismic events." In contrast, the report notes, "Tens of thousands of waste water disposal wells have been drilled in the United States to dispose of the water generated by geothermal and oil and gas production operations, including shale gas production. Water injection for disposal has been suspected or determined a likely cause for induced seismicity at approximately 8 sites in the past several decades." Pete Reiners to chair UA Geosciences Dept. Pete Reiners [right, credit UA] has agreed to serve as head of the University of Arizona Dept. of Geosciences, begining in August, 2013, when he returns from his sabbatical. Jay Quade has agreed to serve as department head during the 2012-2013 academic year. Outgoing department head Karl Flessa will continue to serve as department head through this summer and as Director of the School of Earth and Environmental Sciences during the 2012-2013 academic year. 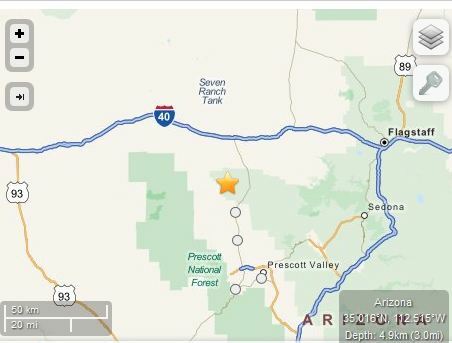 A magnitude 3.1 earthquake just north of the Arizona-Utah border on Friday night at 8:26 pm local (Utah) time was felt in the St. George area. 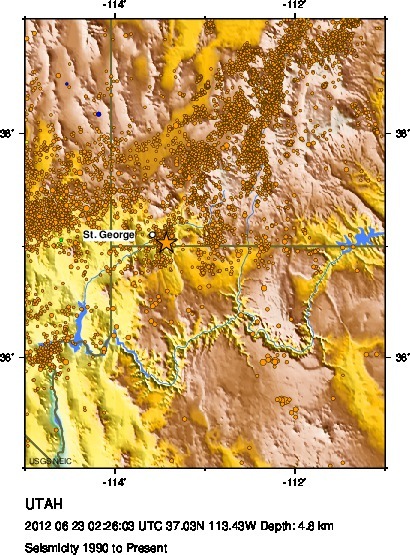 The star on the map at right marks the epicenter [credit, USGS]. The other dots are earthquakes recorded since 1990. Last night's event was west of the Hurricane fault, a normal fault that dips to the west. The article was based on studies on mice, but Wired.com helped put it in perspective in an interview with the articles lead author, Jack Hamilton, who said, "Arsenic is the number one environmental chemical for human health." The past few months have been busier than ever at AZGS with almost non-stop travel for me as part of our growing portfolio of funded projects and roles in national programs. But other than a one-day meeting in Houston, I expect to be in the office for maybe three weeks. Time to get back to blogging. And answering the remaining hundreds of emails. Oh, and getting the new fiscal year budget finalized. And..., oh well, you know the drill. Anyway, the national geothermal data project we are running is picking up momentum. Data are pouring forth from the State Geological Surveys. The DOE external peer review report just came back with glowing results. We're moving into the third year and full operational mode. I haven't talked much about the NSF EarthCube initiative to build a national cyberinfrastructure with the geosciences serving as the prototype. AZGS is leading the development of the governance roadmap and we are members of a few of the technical work groups. The national 'charrette' last week identified the challenges left to integrate all the various components into a functioning system of systems. The new AZGS-run "Arizona Experience" store in Tucson is readying to re-open as a one-stop shop for state and federal publications, maps,hunting and fishing licenses, tourism info, and a lot more. Stay tuned for word of the official grand opening. There's lots of news about these and other AZGS activities plus the Arizona geology world is just as busy as ever. 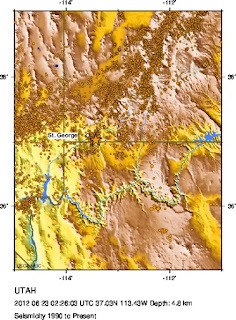 Arizona Public Media posted the podcast and figures of a lengthy interview I had with them recently on seismicity and earthquake hazards in Arizona. I was on the road when it was first broadcast but started getting emails from friends and colleagues who heard it Friday morning. 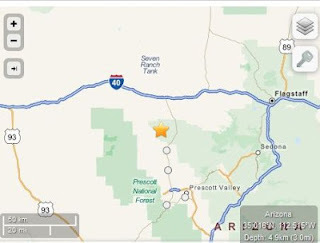 The video below was compiled by AZGS staff using a catalog of earthquakes going back to 1852. The apparent increase in earthquakes over time is due to a combination of more and better instruments detecting remote and small events around the state and our seismologist pouring over the records to identify events that would have been overlooked in the past. The University of Arizona is running a free monthly lecture series in Washington, DC. On Thursday, June 7, Dr. Mary Poulton, Chair of the Dept. of Mining & Geological Engineering, will talk on the topic of "Rare Earths and Mineral Resources: The UA's contributions to solving global mineral resource challenges." The subject matter of other talks this year has included biofuels, NASA’s OSIRIS-REx asteroid sample return mission, and optical sciences. light hors d'oeuvres and a no-host bar at 6:00 p.m., followed by a 6:30 p.m. program. Accessible by Metro at Metro Center or McPherson Square. For detailed directions to the event location, see: http://www.case.org/About_CASE/Directions_to_CASE/CASE.html. The tweet says that 48,585 topos are now online at the National Map from around the country. A recently discovered mineral has been named after Peter Buseck [right, credit ASU] a Regents’ Professor in SESE and the Dept. of Chemistry and Biochemistry at Arizona State University. The mineral, buseckite, was discovered in a meteorite found near the village of Zakłodzie, Poland. Last month scientists from the California Institute of Technology presented their findings of the discovery of the new mineral, buseckite, at the 43rd Lunar and Planetary Science Conference. 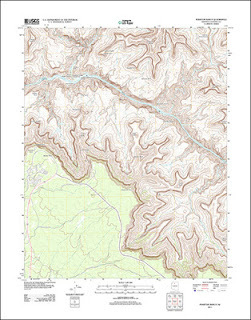 A paper by Chi Ma, John R. Beckett and George R. Rossman describing buseckite will be published in July 2012. The names of the minerals are chosen by the discoverers, after approval by a commission of the International Mineralogical Association. Minerals are generally named after their compositions, places where first found, or people chosen to be honored. Buseckite is an iron-rich sulfide with a wurtzitetype structure. It is black, opaque, and also contains zinc, manganese, and magnesium. The mineral and its name have been approved by the Commission on New Minerals, Nomenclature and Classification of the International Mineralogical Association (IMA 2011- 070). A new video on the legacy of copper mining and Arizona is on the Arizona Experience YouTube channel. AZGS staff on the Arizona Experience project did the research on the history of copper mining, wrote the original script, compiled the photos, filmed the interviews, and produced the first cut. We appreciate Freeport McMoRan Copper & Gold for providing assistance with post-production processing and for the professional narration. A sneak preview of the film was shown to the Arizona Mining Alliance, before its public showing to the American Copper Council when it held its annual meeting in Scottsdale. Gov. Brewer accepted a a national award at that meeting on behalf of the men and women in Arizona's copper industry. The hydraulic fracturing process itself. 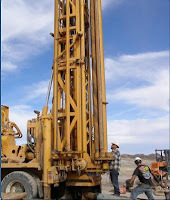 Geophysical monitoring of hydraulic fracturing. Economic and environmental issues related to hydraulic fracturing. Regulatory issues related to perceived threats to infrastructure, groundwater and groundwater availability. New approaches to monitoring and assessing possible near-surface impacts of hydraulic fracturing.